New Apple 3G iPhone Announced @ WWDC 2008! 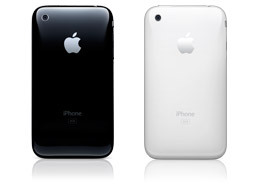 The new Apple iPhone 3G was announced today (6/9/2009) at WWDC 2008 in San Francisco. The new price is only $199 (8gb) and $299 (16gb) due to carrier subsidies. It has tons of new features built into it, notably GPS and 3G (of course) and will definitely make inroads not only into the corporate market with the new MS Exchange functionality, but also into the more frugal consumer market. $199 makes this phone very competitive with the higher end blackberries and cheaper than most of the Microsoft Smartphones. Most of the base features are the same, like the flash storage capacity, but Apple did take suggestions from the community and improve the design, such as making the headphone jack flush as to not require a special adaptor to use non-Apple headphones. Look for the new iPhone to reach stores around July 11th. Hopefully supply will be able to hit the demand that I anticipate. I plan on getting ahold of one for myself.